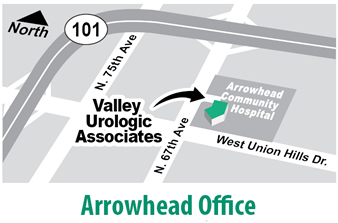 Our Urology Practice has many convenient locations. 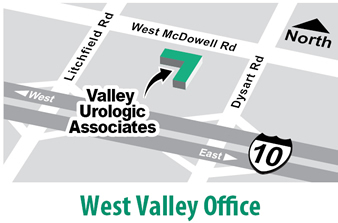 Valley Urologic Associates offices are located in four convenient locations in the Phoenix Valley. Our West Valley office is located on the campus of West Valley Hospital across from the Hospital parking lot in the medical office building in Suite 304. At the Arrowhead location, we are in the medical office building adjoining Arrowhead Hospital from the main lobby in Suite 230. 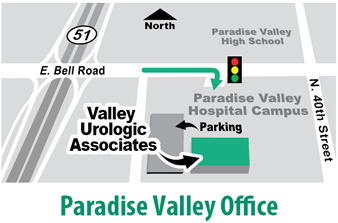 At the Paradise Valley location, we are in the medical office building just behind Paradise Valley Hospital in Suite 3600. 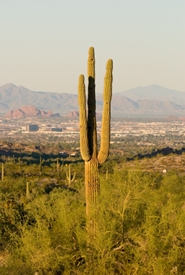 Our newest location, in central Phoenix, is located in the medical office building on the campus of Honor Health John C. Lincoln Medical Center. Please see the links to the right for directions to our offices. If you get lost, please do not hesitate to call us.